Nova IVI Fertility has been publishing “Infertility Management Series” over the last few years; there have been 7 editions in this series till now. 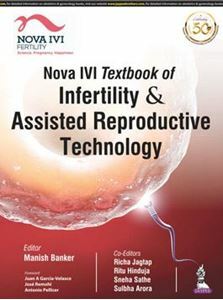 Keeping in mind the overwhelming response to this series, the authors found it appropriate to compile all the editions, add a few more chapters, and come out with Nova IVI Textbook on Infertility and Assisted Reproductive Technology. It covers everything from the basics of infertility to the most recent developments in the field of ART. Renowned authors from India and the World over have contributed to this book. This will help postgraduate students and gynecologists who have a special interest in Infertility and ART. Chapter 6: Mechanical Issues in Fertility: How do we evaluate? Chapter 12: When to Stop Investigating and Start Treating? Chapter 14: Investigating the Subfertile Male: Which Tests are Practically Relevant? Chapter 17: Varicocele Surgery: Does it Help? Chapter 72: Adenomyosis and Infertility: What are the Options?